More than 150 people crowded into Burlington City Hall Auditorium Thursday evening to rally behind Chittenden County Transportation Authority drivers, who are threatening to strike on Monday if they do not get an acceptable new contract this weekend. Speakers at the event, including drivers and representatives of other local unions, accused CCTA leaders of treating drivers harshly and negotiating in bad faith. As 25 other drivers stood behind him, bus driver Mike Walker said the CCTA management team "insists on having all the authority, but none of the responsibility — a management team that wants to drive a bus from a desk." 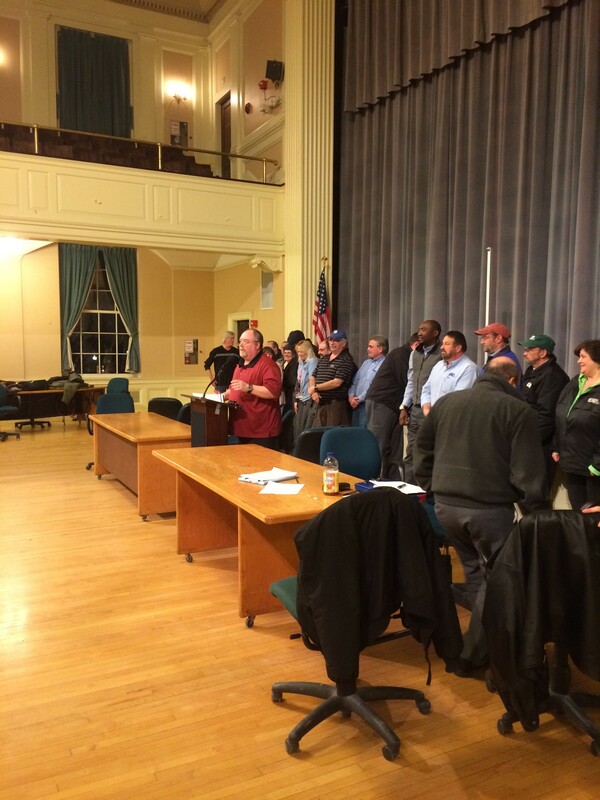 CCTA bus driver Mike Walker speaks to the crowd inside Burlington City Hall Auditorium on Thursday night. CCTA and its drivers have failed to reach an agreement on a new contract despite holding nearly a dozen negotiating sessions since last summer. In February, drivers voted 53-4 to reject CCTA's most recent contract offer. While the Teamsters Local 597, the drivers union, and CCTA have largely agreed on salary and benefits, drivers say they are unhappy with their working hours and conditions, and what some speakers described as "predatory management." In particular, drivers are critical of CCTA's increasing use of split shifts — working during the morning and evening commutes, with a few hours of rest in between — and say the agency would like to hire more part-time drivers. Chittenden County State Sen. Phil Baruth echoed that, saying he was concerned that CCTA's management was determined to weaken the union and eventually trim the number of full-time drivers. "It's part of a larger anti-union context," Baruth, a Democrat, told the crowd. "These little niggling things that aren't about money now...will be about money and full-time jobs down the road." Negotiations are scheduled for Saturday. Rallies in support of the drivers have been organized for Saturday morning at CCTA headquarters and Sunday afternoon at the Vermont Workers' Center. Emma Mulvaney-Stanak, state chair of the Vermont Progressive Party and a former Burlington city councilor, criticized Burlington Mayor Miro Weinberger for failing to get involved in the dispute. Weinberger has issued a couple of short public statements urging a settlement, but has not entered the fray. He also declined Seven Days requests for an interview on the subject. "I have been really disappointed in the mayor of Burlington," Mulvaney-Stanak said. "It's shameful to say, 'I don't have an interest in it because the city of Burlington is not in the contract." CCTA provides 10,000 rides a day. Large local institutions such as the University of Vermont, Fletcher Allen Health Care and the HowardCenter rely on the bus system to transport its employees, clients, and students. Additionally, about half of the Burlington School District's students rely on CCTA buses to get to school. At last evening's event, Milton teacher Heather Dudley, representing her district's teachers union, read a letter urging the Burlington School District to abandon any plans to hire outside drivers in the event of a strike, saying it would weaken the CCTA union's efforts. Earlier in the day, CCTA released statements blaming the union for the potential strike and noting it would shut down service on all but two routes. Also speaking were representatives of unions representing University of Vermont faculty, Fletcher Allen Health Care nurses and home-care workers throughout Vermont. Correction: Former Burlington city councilor Emma Mulvaney-Stanak spoke at the rally on behalf of the Vermont Progressive Party — not the Vermont-NEA, as stated in the original post. But she does work for the NEA, as a paid organizer.